Three things. 1) I’m not a fan of climate skeptics, ever, 2) there is no “jugular” for anti-science movements when it comes to communication — the zinger logic works both ways, 3) “Climate Hustle” (and Marc Morano) scored it’s highest pinnacle of media exposure Monday night in being mentioned on Jimmy Kimmel Live. Way to go, Jimmy. NOT CLEVER, NOT HELPING. This is the current “Moviemaker” plot for “Climate Hustle” from IMDB Pro (you have to subscribe to get access to it). It’s the Hollywood scorecard for a movie. This is up to May 1, the day before “Climate Hustle” scored it’s highest profile media hit as the subject of a 7 minute rant on Jimmy Kimmel Live! on ABC. Next week’s rank will be higher. On Monday night ABC comic host Jimmy Kimmel delivered a 7 minute comic rant about Sarah Palin and “Climate Hustle,” the new “documentary” from climate skeptic Marc Morano. While some people inside the bubble of the climate community thought it was “devastating,” I would suggest it was more of a major coup for Morano to receive such high profile attention. And for free. Everyone talks about how much free “earned” media exposure Donald Trump receives. This is the same thing. The Trump exposure is mostly about what a fool he is, yet has been a major key to his success. The content of what is said is irrelevant, it’s that they are talking about him at all. Same thing for Morano. 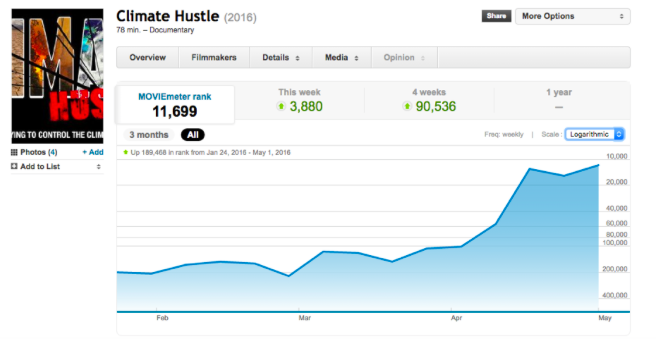 How well is “Climate Hustle” doing in Hollywood terms? Here’s a list of current rankings of a variety of recent documentary feature films according to the Moviemeter score calculated by the industry website IMDB Pro. It includes all the Oscar-nominated documentaries for this year. It’s already scoring on the same level with one of them, “Winter on Fire.” I’m sure if you check next week it will have jumped ahead of lots of these films, in part thanks to scoring a mention from Jimmy Kimmel. Well, sorry, but you find the same logic throughout the science world. I’m dealing right now with methods of teaching that common sense tells you they work, but running up against scientists who say they are not going to believe it works until they see data to show it. Same thing. On a broader scale, this is the same way that the climate skeptics learned “doubt casting” from Rachael Carson and her attacks on pesticide use. Andy Revkin gave a nice review of this in 2012. Both sides are using the same basic logic when it comes to humor. Academics and scientists have a tendency to think there is a way to “slit the jugular” of their opponents simply by out-arguing them. It was one of the most annoying comments I heard about my movie “Flock of Dodos,” in 2006, coming from some of the top academic evolutionists — that they found the movie disappointing in that they had hoped it would have “gone for the jugular” more. As if there was some way to make a movie about academic discourse that could somehow with a single zinger or dramatic moment bring about the collapse of the entire opposition. There ain’t. Yes, “Blackfish” did do an amazing job of crippling Sea World, but they had stories of death to use for ammunition. That’s different. When a comedian like Jimmy Kimmel ridicules an anti-science movement it’s not in the same league. So as funny as Jimmy Kimmel may be, and as admirable as it is for him to take on social issues seriously at times, he is not the person who can actually damage the climate skeptic crowd. He has no real gravitas, and more importantly, all he did was create an equally silly scene of humble scientists using profanity. To date I have still seen only one truly brilliant piece of climate comedy, which was the prank the Australian group “The Hamster Wheel” pulled on climate skeptic Lord Monckton. I just now watched it again. If only anyone in this country had the cojones to create that sort of comic material. So brilliant. So utterly, utterly brave and brilliant. If someone went after the climate movement with that level of coldheartedness it might actually be possible to slit their jugular. But it ain’t gonna happen in America.